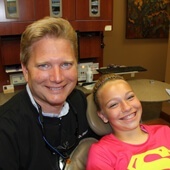 Dr. Grebner is a certified Invisalign provider and treats teens and adults using clear aligners to straighten teeth. Dr. Grebner also uses an iTero Element to take a digital scan of your teeth instead of using impression material. Never hold back a smile again! Schedule your free consult today. Our dentists have the training and expertise to work with children and adults to improve under bites, over bites and crooked teeth with braces. Orthodontics improve your smile by applying a steady pressure to move your teeth where needed. For patients unhappy with their discolored smile, teeth whitening may be an effective option for you. We offer $100 custom-fitted whitening trays to all of our patients. Dental bonding is a minimally invasive and less expensive way to correct a variety of concerns about the appearance of your smile. We’ve produced great results with chipped, cracked or discolored teeth. We’ve also used this procedure to close spaces between teeth, make them look longer and to improve the shape of teeth. A more permanent solution would be veneers or Lumineers. Dental veneers are used to improve the color, shape, size or length of teeth. A thin shell is custom made to fit over your current tooth and leaves you with an improved smile. Our dentists would be happy to discuss if veneers are a good option for you. Family Dental Care is your Aberdeen provider for Lumineers. Lumineers are an alternative to traditional veneers. Lumineers can be made as thin as a contact lens. With most Lumineers no drilling is needed to prepare the tooth for the veneer. 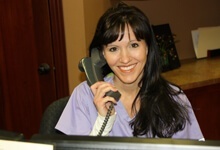 In just two visits you can have a beautiful smile that lasts for years.